Co-Broking of Real Estate projects and new developments are now accessible to any company who would like to commercialise leveraging the power of an international network of agencies yet without the need to contract an intermediary for marketing & sales. 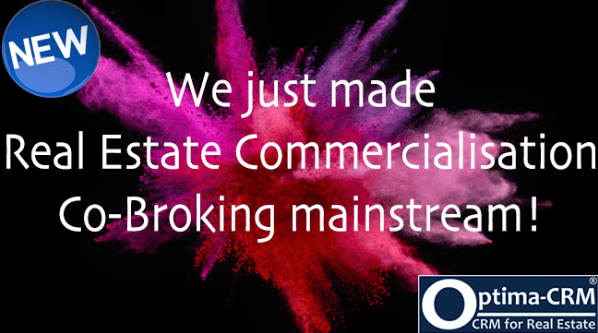 ake commercialisation in your own hands with the NEW CO-BROKING functions of our Optima-CRM solution. Come and test-drive our innovative solution today! There's never been a better time to save big time! - Full Project commercialisation management: manage inventories and release by phases, mass price updates by phase, generate dynamic price lists, etc. - Upload your professional marketing materials (brochures, window cards, email templates, building specifications, floor plans, renderings & images, etc.). - Allow specialty agencies to join your network so they can promote your project in their local markets. - Agencies download your marketing materials yet branded for each individual agency (logos, contact information,...). - Agencies can register their clients through your portal into CRM for easy scheduling and follow-up. - Publish your project to your own website with unique content & SEO optimised. - Export XML feeds with your project & properties to feed participating agencies with separate content to not impact your own website, or share via the internal MLS functions of Optima-CRM with member agencies. Also, export to any portal of your choice. YOU control how THEY market your project! With Co-Broking, you control every aspect of how end-clients visualise your project whilst specialist agencies promote it in their name to their markets bringing you clients straight to your door.ARE YOU A PROMOTOR / DEVELOPER? ARE YOU AN AGENCY WITH A PROMOTION TO PROMOTE? ARE YOU A COMMERCIALISATION COMPANY FOR A PROMOTION? Then you should learn more about Optima-CRM Co-Broking and how it could be also YOUR solution.